I seriously can't believe it’s only been a week since I launched the Village Monsters Kickstarter. It’s been a tremendous experience, and though there’s a long way to go I couldn’t be happier with the support I’ve had. To all current and future backers - thank you!!! As you might expect, development of the game itself has been impacted. However, I’m happy to report I’m still hard at work! Let’s take a look at what I’ve been doing. Alpha 1.03 is out - Now with Linux support! A new version of the Alpha demo is now live and ready to download. This includes a demo playable in Linux for the very first time! You can grab it right here on Itch. Beyond Linix support, this demo also contains a number of crash fixes, some new items and dialog, and the new ability to switch to a female player character from your home. Speaking of female characters, many folks have recently asked me if it’s possible to customize your character’s gender and look. The answer is a resounding yes. In the final game you’ll have total control over your character’s gender, skin color, hair, and much more. I haven’t done the best job of mixing it up in my screenshots, but that’ll change from here out. Similarly, the next demo will contain some more options for customizing your look. And a whole lot more. 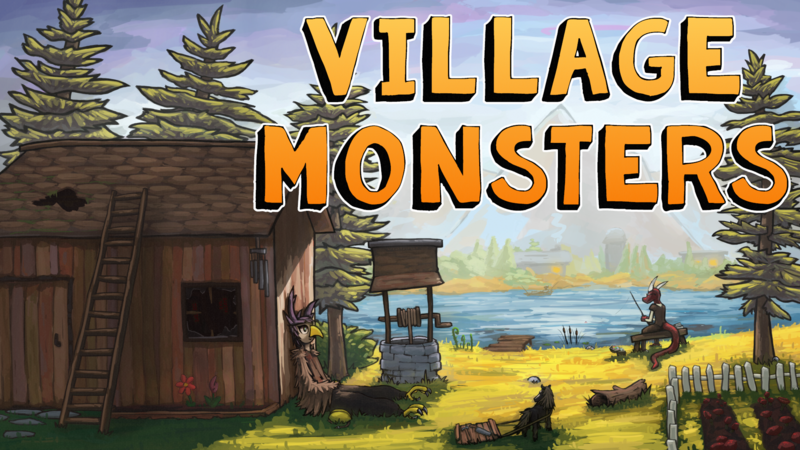 This is just the next step of many to ensure that the world of Village Monsters never feels stale no matter how much you play it. Late last week I wrote up a detailed post explaining how exactly Mysteries will work in Village Monsters. This week I’ve begun to flesh out the system even more with the intention of letting you solve some of the very early mysteries in an upcoming demo. More info will be coming on that later, but I’m pretty excited by how things look now. Finally, I want to talk about the very first thing you see in game - the title screen. The current title screen was a first draft of an idea that I’ve grown increasingly unhappy with. I’m now working on a new title that better matches the style of game I want in Village Monsters - colorful, bright, and inviting. The below mockup shows the new look I’m going for. I hope to have it completed this week so I can begin the ‘rebranding’ process. That’ll do it for now!